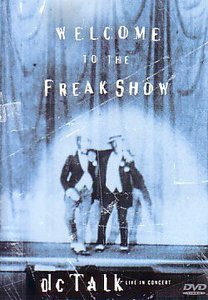 - Publisher WELCOME TO THE FREAK SHOW captures the energy of dc talk, Christian music's biggest selling group, on stage and behind the scenes. This DVD is jam-packed with live performances from the Grammy-winning, multi-platinum trio as they celebrate their biggest-selling album to date, Jesus Freak. This DVD showcases amazing music videos like "Jesus Freak," "Colored People" and "Just Between You and Me." WELCOME TO THE FREAK SHOW is the consummate dc talk fan must-have! About "Welcome to the Freak Show"
WELCOME TO THE FREAK SHOW captures the energy of dc talk, Christian music's biggest selling group, on stage and behind the scenes. This DVD is jam-packed with live performances from the Grammy-winning, multi-platinum trio as they celebrate their biggest-selling album to date, Jesus Freak. This DVD showcases amazing music videos like "Jesus Freak," "Colored People" and "Just Between You and Me." WELCOME TO THE FREAK SHOW is the consummate dc talk fan must-have!